Time for city cyclists to get their own tube network? For the past eight years, I have had the sometimes-dubious pleasure of living in London’s King’s Cross neighbourhood. Being so close to the centre of the city, I do my best to cycle as often as I can around town. However, my repertoire of safe cycle routes is rather limited, and I dread straying too far away from my familiar routes and ending up somewhere where I have to battle my way home through the frenzied London traffic. The result is that I cycle less often, and less far than I would like to. To be fair, these days there is a wealth of websites and apps that could help me navigate safely around London by bike. The trouble, though, is that the safe bike routes themselves are just too complicated. Take an example. Let’s say I wanted to cycle from my home in King’s Cross to St. Thomas’s hospital near Waterloo. Although I know the walking route I would take to get there, I have no idea how reach the hospital safely by bike. Go to the Transport for London (TfL) website and it suggests a route that involves no fewer than 57 stages—as compared with two stages for the same journey by tube (Piccadilly line to Leicester Square, then the Northern line to Waterloo). Indeed, London’s cycle network is so complicated that TfL appears incapable of displaying it as a complete map on its website. Instead cyclists must order 14 paper maps to cover the whole city, plus a separate PDF for each of the new cycle superhighways that are currently being built. Even where individuals have gallantly tried to produce simplified bike maps of London, the end result still bears too much resemblance to a plate of spaghetti. Other cities have had a go at creating much simpler cycle maps aimed at encouraging more people to cycle. In Edinburgh, for example, Mark Sydenham and Martin Baillie have developed a tube map for bikes. But the reality is that Londoners, like the citizens of many large cities, actually use the public transport network as their “mental map” for getting around their city. The idea that Tim Miller and I suggested is that planners should build a bike network that recreates this mental map we are all so familiar with. London’s bike network would directly resemble the tube map; Newcastle’s would follow the metro map, and so on. In the jargon, what we are calling for are cycle networks that are “homeomorphic” or “topologically equivalent” to their public transport network. So in London, the cycle network we would like to see built would join up every tube station using analogous bike lanes to the tube lines – sharing the same names, colour codes and destinations as the tube lines. So in this new world, my journey from King’s Cross to St. Thomas’s would simply involve taking the “Piccadilly bike lane” to Leicester Square, and turning left to go down the “Northern bike lane” to Waterloo. What would be the costs and benefits of this proposal? 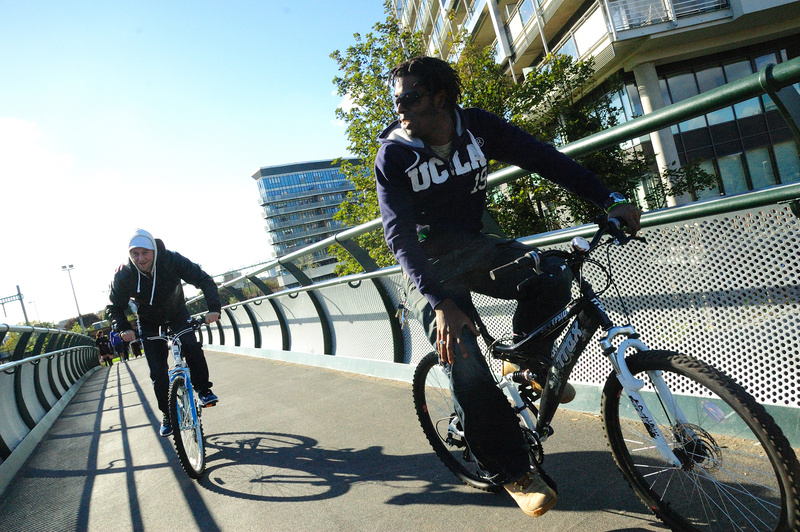 Clearly, to build a network of safe cycle routes would take a large, sustained investment. It would require building tens of kilometres of off-road bike lanes and closing off a considerable number of streets to through vehicular traffic. However, the London tube map is a fixed asset that will be with us for generations to come, so this expenditure should be viewed as a very long-term investment. Just as with the tube network’s 150 year history, we would need to start small and build up the cycle network slowly, bike lane by bike lane and tube stop by tube stop. From a public health perspective, I suspect the benefits of this proposed scheme would be at least fivefold. First, it would encourage more people, including visitors to the city, to make longer journeys across town because they would now have more confidence that they could get to where they were going and be able to find their way back in one piece. Second, it could reduce fatalities if more cyclists used off-road cycle lanes and quiet roads that had been closed to through vehicular traffic. Third, it would reduce the city’s carbon footprint. Fourth, it would encourage cross-modal journeys because the cycle network and the rail network would now be inextricably linked. But finally, and rather sneakily, we might be able to increase journey distances from point A to point B by designing cycle routes between tube stations that were slightly more circuitous than were strictly necessary.